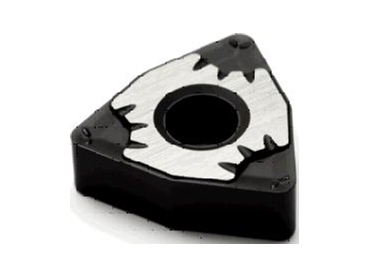 Seco Tools AB announced its new crown-shaped MF5 chipbreaker optimized for the medium/finishing application area commonly associated with near net machining. The groove is designed to generate low cutting forces and allow for high feed rates when the depth of cut is between 0.5 and 2.7mm (0.020 and 0.100 in.). Field tests of the MF5 chipbreaker revealed that MF5 significantly increased tool life in 67% of the applications and offered an improvement in chip control in 41% of the tests. Key features of the new MF5 chipbreaker include its unique three-pronged crown shape as well as its designed-in chip deflectors and cooling ditches, which are beneficial at low depth of cut and work well with ultra-high pressure coolant. Additionally, its open geometry results in the reduction of cutting forces. MF5 chipbreaker also features a ground island, which improves insert seating and the conduction of heat away from the workpiece as well as the cutting edge. In a roughing operation conducted on a steel rock drill (42-45 HRC) using MF5 chipbreaker with TK1000, tool life increased by 500%. In a similar test where MF5 was used in conjunction with grade TP2500, productivity increased 55% in addition to a 360% increase in tool life. The MF5 chipbreaker is being offered in a choice of standard C- , D-, T- and W- style inserts and grades TK1000, TK2000, CMP, TP1000, TP3000 and the newly-announced Duratomic TP2500.